The laboratory is a Cooperative Research Group of Department of Chemistry, Graduate School of Science. Information on Graduate Course is here(Dept.) or here(Grad. Schl.). We welcome your visit to our laboratory in Katahira Campus. We study advanced nano-micro technologies in chemistry and biochemistry and their applications to integrated analytical devices. We investigate easy and automated analytical technologies for life science, environmental science, food safety, and industrial process.We also investigate novel analytical technologies such as single cell analysis, single molecule analysis, single event analysis, and molecular behavior in rapid mixing. For the advanced technologies, fundamental chemistry such as chemical reaction and phase transfer in a confined space should be revealed in detail. We study unique advanced measurement tools such as microscopic imaging, laser microscopy, and electron spin resonance (ESR) spectroscopy. 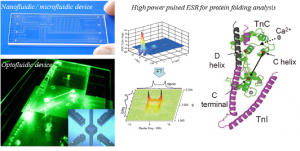 Easy and automated chemical analysis utilizing nano/microfluidic device. Liquid-film separation / preconcentration method based on interface chemistry. Imaging microscopies and detection methods for microspace. Structure-function relationship of biological molecular systems studied by high power pulsed ESR.